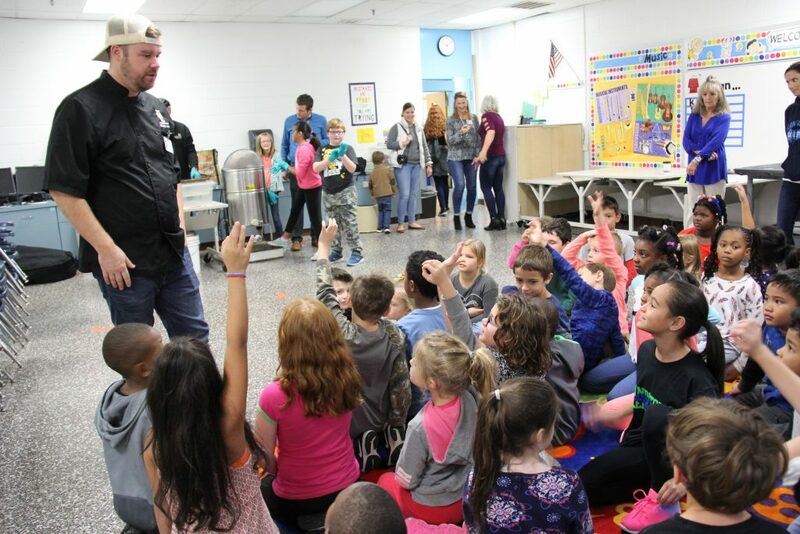 “What foods do you think we can make with honey?” the school division’s recently-hired chef Kip Poole asked a roomful of Landstown Elementary School students. “Honey bread!” exclaimed one second-grader. “Honey chicken,” another student chimed in. “Yes!” the students replied in unison. 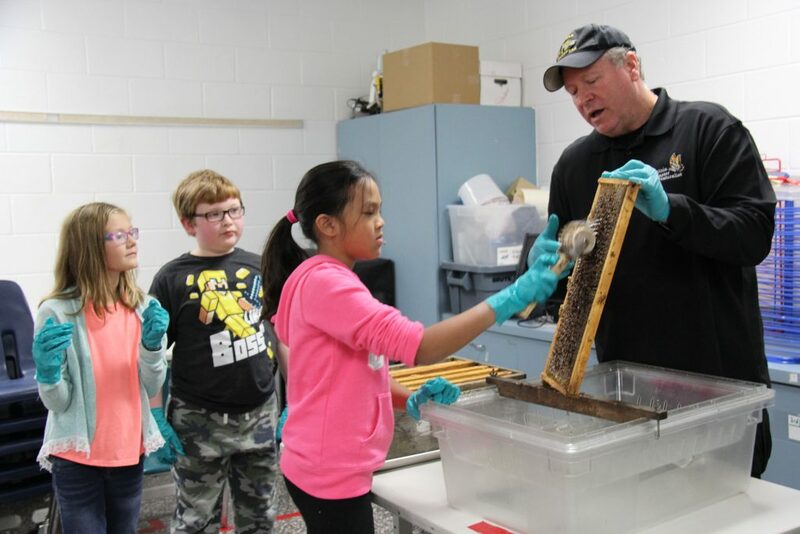 Poole teamed up with Norfolk Beekeepers Association president Frank Walker at Landstown Elementary School Oct. 26 to get students’ ideas on how honey can be used in foods and to show them how honey is extracted. “How many of you knew that you have your own beehive at Landstown Elementary?” Walker asked as students eagerly raised their hands. “Outstanding!” Walker replied as he began describing the video behind him showing how a beekeeper outfitted in his full suit taking frames out of a bee box – the same one that is located under a giant Oak tree at the front of the school. 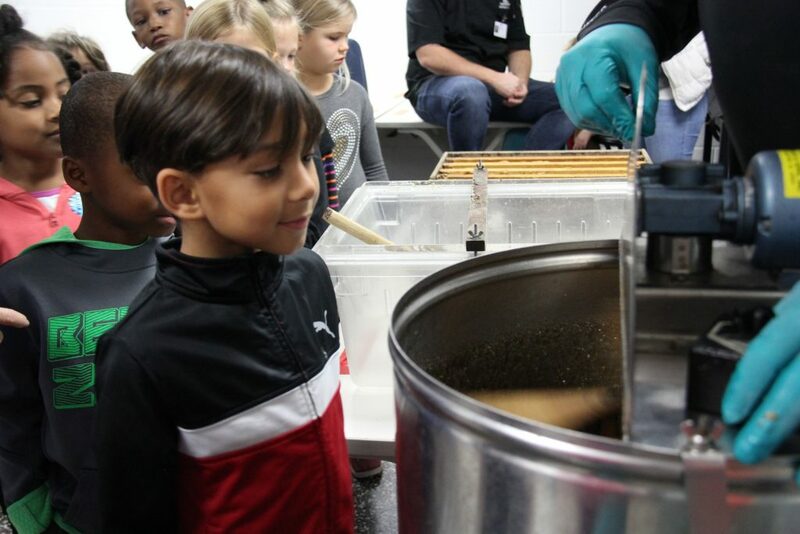 After the video, students lined up to see three designated fifth-grade assistants rolling an uncapping tool on the frames and to get a sneak peek inside the extractor tank filled with honey. For students these were two exciting presentations since, thanks to their school’s gifted resource teacher Kim Bielmann, classes have been researching how vanishing pollinators are important contributors to the world’s food supply. Bielmann and other gifted cluster teachers started the project four years ago as a problem-based learning opportunity. Second graders study hummingbirds. Third graders study bats. Fourth graders study monarch butterflies and fifth graders study honeybees. That project has since grown into Landstown not only embracing sustainability, but in students taking action to help the world – even creating an outdoor learning lab thanks to funding from the Virginia Beach Education Foundation. The following year, Bielmann secured another grant – this time for a bee box at the school, an idea suggested by one of the students. Students painted the box and Walker, who also assists with Kellam High School’s Pollen-Nation beekeeping club, provided the colony. This summer marked the first full year of Landstown’s beehive so Walker and Poole, who is leading the division’s scratch cooking program, teamed up for the honey extraction presentation and to talk with students about how their work to help bees can make a difference in the foods they eat. Fifth-grader Lea Iguban agrees that their work at Landstown is going to help the future.